You’ve heard the argument that MLM provides a wonderful opportunity. You decide how much you make. You control your own destiny. You can’t be laid off or fired. You’ll be financially independent, and you’ll make money on your own terms. But anyone who’s ever made it to sales director in Mary Kay can tell you that there is no “job security” in Mary Kay. There are about 12,000 sales directors in the U.S., and probably about 500,000 consultants. For all but a few hundred sales directors the earnings are dismal and very unsteady. 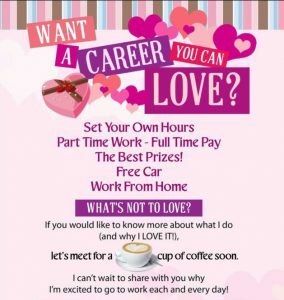 And even if you are one of those few hundred who make a real career living from Mary Kay, you can go from the top to the bottom in a matter of a few months. There is no such thing as stability in Mary Kay. But they would have you believe there is. When some companies are announcing layoffs and restructuring, Kaybots use it as an opportunity to recruit. If they can fill your head with the false notion that you’re in control of your earnings and you dictate your own destiny, they win. The word of the day……. Layoff. Have you seen all the companies in the news experiencing cutbacks & layoffs? It begins to make even the most job-secure worker feel a little woozy! You may not be worried about layoffs, job cuts or wage freezes, but during times of workplace instability its still SMART to create some career insurance ~ just in case. So …. How can your Mary Kay business be that insurance? No, not In the way you think ~ I’m not advising you to quit your job and work Mary Kay full time if you aren’t ready. Just allow your business to give you a hand. The piece goes on to talk about using MK as a backup plan. How it will give you a financial cushion during a job search. How holding one or two parties a week could mage a HUGE difference in your budget. It’s all nonsense. 99% of women actually lose money in Mary Kay. Save your money. That’s far more security than Mary Kay could ever give you. Mary Kay a Less Stressful Way to Pay the Bills? Tough Financial Times Mean More Opportunities to Exploit via Mary Kay! I am glad that I did not pursue this opportunity. I was a consultant for a little while, but I ended up returning my inventory and getting my money back. It was a long time ago, but every now and then I visit this site. I am not bitter about it at all. It wasn’t the part time opportunity that I thought it was going to be. I need a job that will have benefits, and a steady paycheck where I know how much I am making, and the hours worked. A job where I am in one place helping people and not driving to here and there to make ends meet. So glad you wrote this… If only they would take the time to stop and think about how they are supposedly “making executive money”.. I mean, really look. Look at their tax returns, and their sheets ( I think there was something where you could see how you are doing as far as sales, inventory, net profit, etc.). It would be an eye opener. Set your own hours: Good luck trying to book everything between the house of 9-3 on weekdays. Part time work – full time pay: Do the math. Even a minimum wage job that offers benefits is a better deal. The best prizes: Prizes don’t pay the mortgage/utilities or put food on the table. And they are taxed as if they are income. Free car: You mean free USE of a car. And that “free” car often comes with copays and insurance that are higher than using your own vehicle. Work from home: Then why is it that so many consultants are constantly posting about all the meetings and seminars they attend? And don’t most of the skin care classes and “pampering” sessions involve traveling? The sad part is that now so many minimum-wage jobs that are part-time *don’t* offer benefits. This does not mean Mary Kay is good! It just points out how dismal some other opportunities can be (if they make MK look relatively good, they must be really bad!). Thanks, rdr, you made some excellent points with your “do the math” examples, especially pointing out that not earning anything is better than going deeper into debt. That full time pay for part time work claim should raise suspicions with anyone. Let’s say you booked and coached 3 classes for the week. Everything was going perfectly, but then hostesses cancelled. Or, their guests starting bailing. There is no job security when you’re dealing with people and voluntary events! How many unit meetings did I plan and pack for, only to have sparse attendance? How many interviews did I skirt and hose up for, only for the customer to not show? Even with government shutdowns throughout the course of history, those employees get paid for that time once it reopens. Nothing in MK is guaranteed pay. Never in over 10 years did I get the same, identical commisssion check as another, yet I have with my career. And, for the record, never in my 10 plus years did I dovetail once. You can’t give away something you don’t have.